The Karlskirche cathedral is a unique architectural curiosity, a mix of ancient Greek and Roman elements with Byzantine, Renaissance, and Baroque styles. 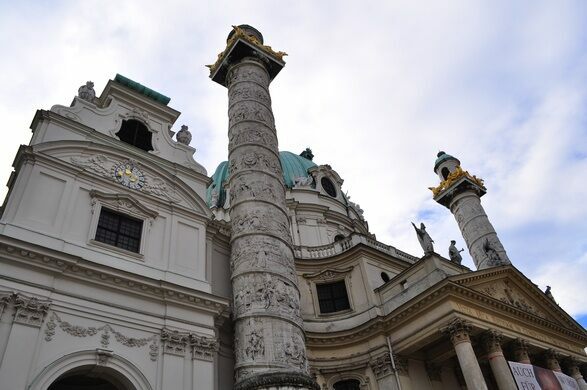 Commissioned by the Habsburg Imperial Court to fulfill a religious vow, its symbolic details also sought to bolster Vienna’s historic claim as the temporal center of Christendom. In the early 18th century, Central Europe was hit by the last great outbreak of the Black Plague. Holy Roman Emperor Charles VI made a vow to build a church dedicated to St. Carlo Borromeo—revered for attending to Milanese plague victims in the 16th century, and the emperor’s namesake—if the city was saved. 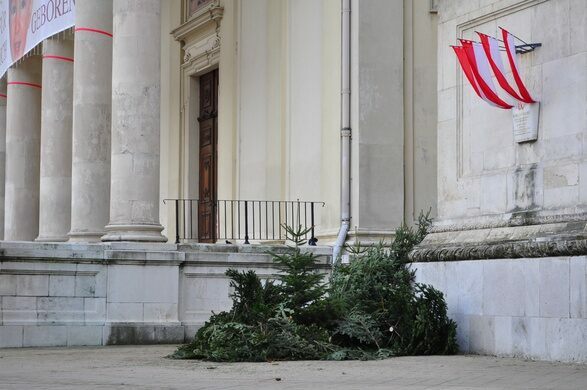 After the plague passed, the new church was officially announced in 1713. 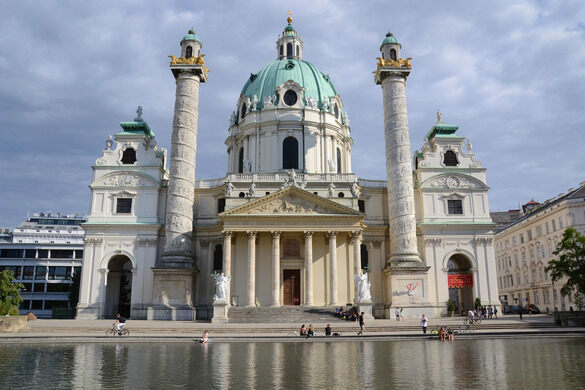 The church was designed by court architect Johann Bernard Fischer von Erlach, whose Baroque architecture profoundly influenced and shaped the tastes of the Habsburg Empire. 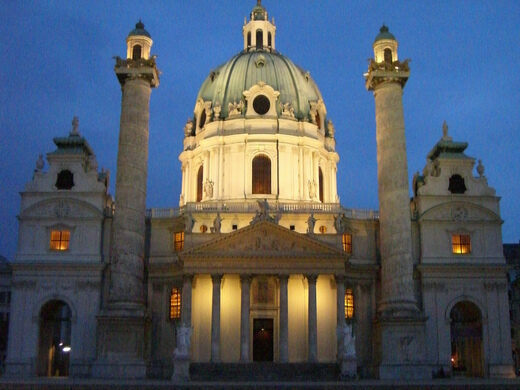 Von Erlach’s ambitious design is centered around a portico in the Ancient Greek temple style, flanked by two columns modeled after Trajan’s Column in Rome. The twin columns reference Solomon’s Temple as well as the Pillars of Hercules (a symbol adopted by Charles V to represent the Holy Roman Empire), and are together reminiscent of the Pantheon of antiquity. The columns feature reliefs crafted by the Italian sculptor Lorenzo Mattielli, and depict scenes from the life St. Borromeo. The dome recalls that of St. Peter’s Basilica, but is remarkably different in that the base is an elongated ellipsoid. At the main altar, a scene portrays the ascension of St. Borromeo. 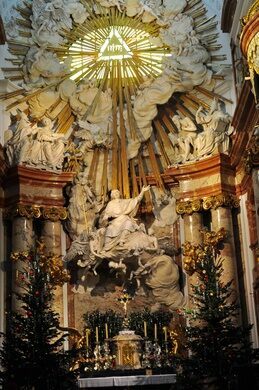 Above the sculpture group, a circle of angels and sun rays is arrayed in front of a source of light, echoing a similar design found in St. Peter’s Basilica. 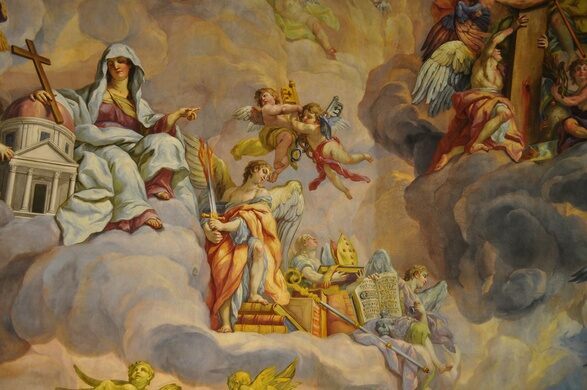 The fresco of the dome was painted by Johann Michael Rottmayr of Salzburg and Gaetano Fanti of Bologna, and displays an intercession of St. Borromeo—supported by the Virgin Mary—pleading to the Holy Trinity to end the plague in Vienna.